If you don’t have time to read the whole article, just do these three things. If you’re traveling to Central America or the Caribbean, watch this video first. You could save a sea turtle’s life. 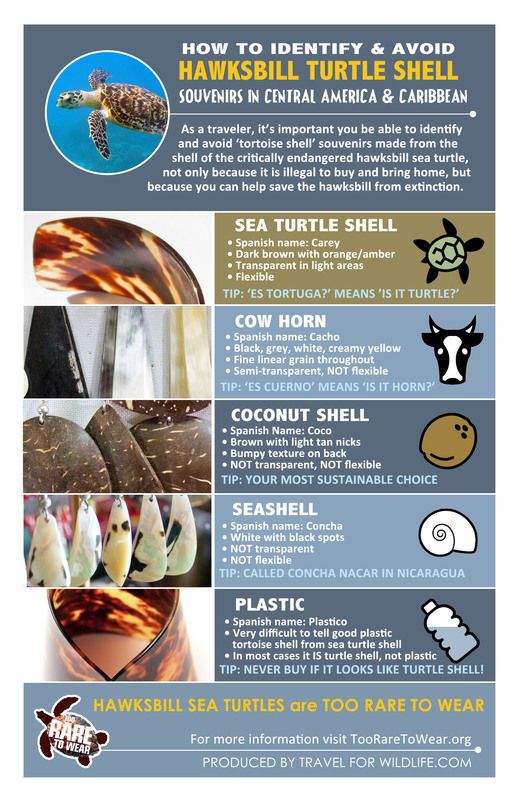 Either save it on your phone or print it and take it with you so you can recognize and avoid turtleshell souvenirs when you’re traveling. You can download the pdf version or download the jpg (or just click the image below to view full size, then right-click and choose “save image as”). ‘How to Identify Turtle Shell’ info-graphic. Download to your phone or print it! This was designed for Central America & Caribbean countries. You can also find a general identification info-graphic on the Too Rare To Wear resources page. Think you can recognize sea turtle shell already? Jump to the end and take the quiz! 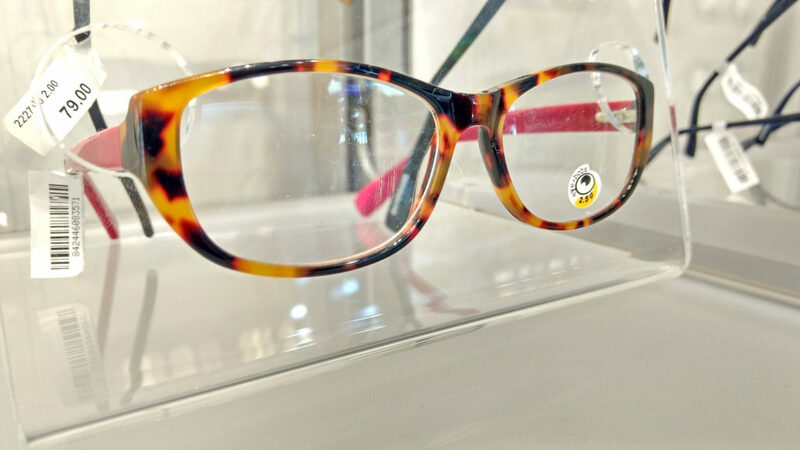 Everyone has heard of tortoise shell. 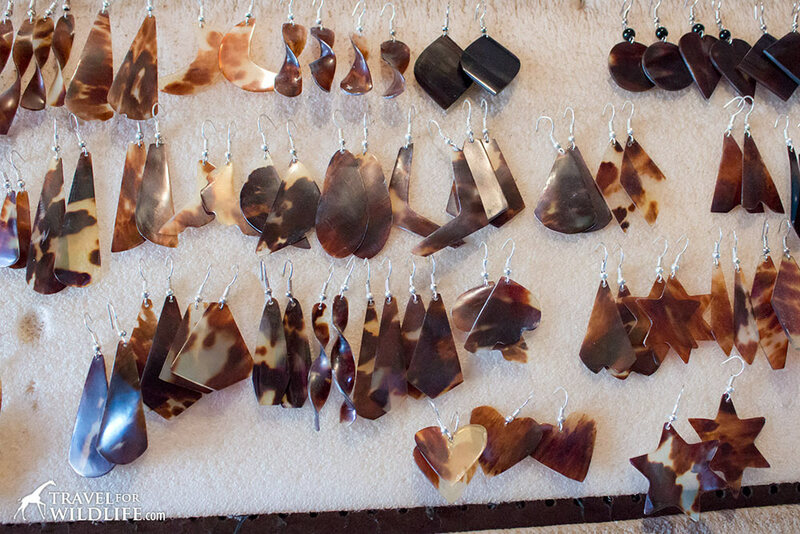 It’s that beautiful translucent brown and amber material that’s used to make decorative items from tortoise shell glasses and guitar picks to hair clips and bracelets. What most people don’t know is that “tortoiseshell” is actually made from the shell of the critically endangered Hawksbill sea turtle. 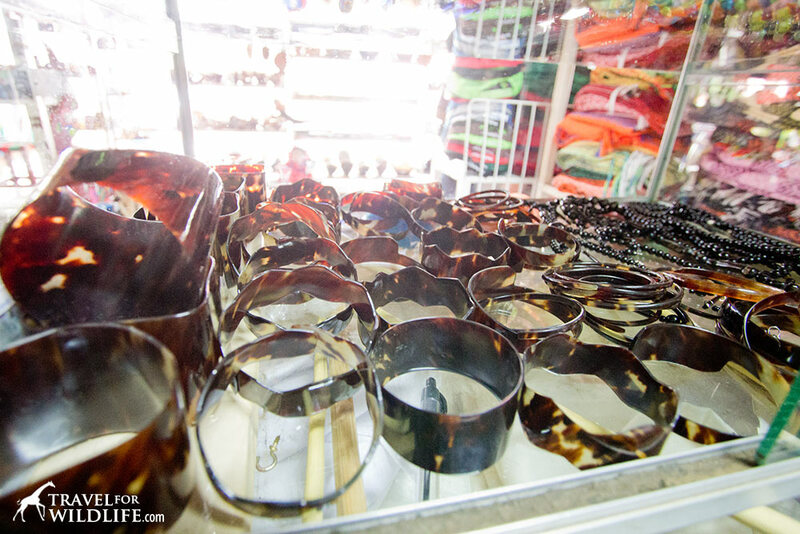 In most countries, tortoise shell glasses are now made from plastic. 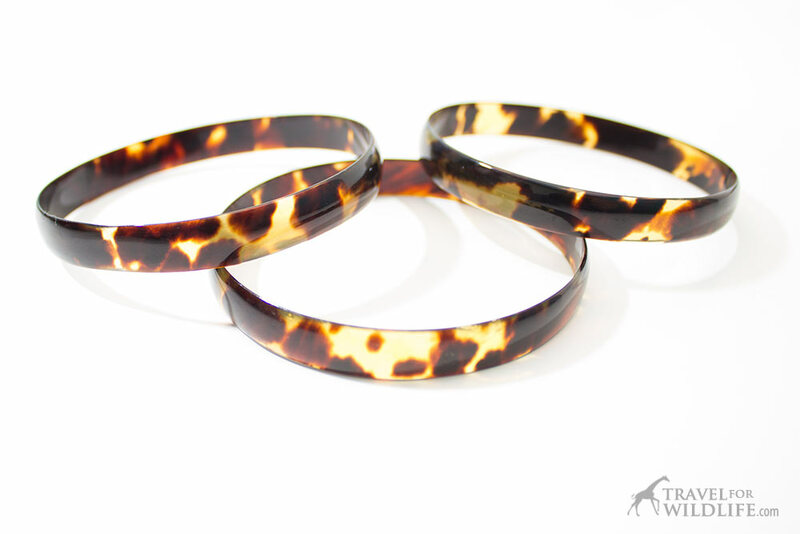 But originally, all tortoise shell was made from hawksbill sea turtle shell. In most countries “tortoiseshell” is now made from plastic. 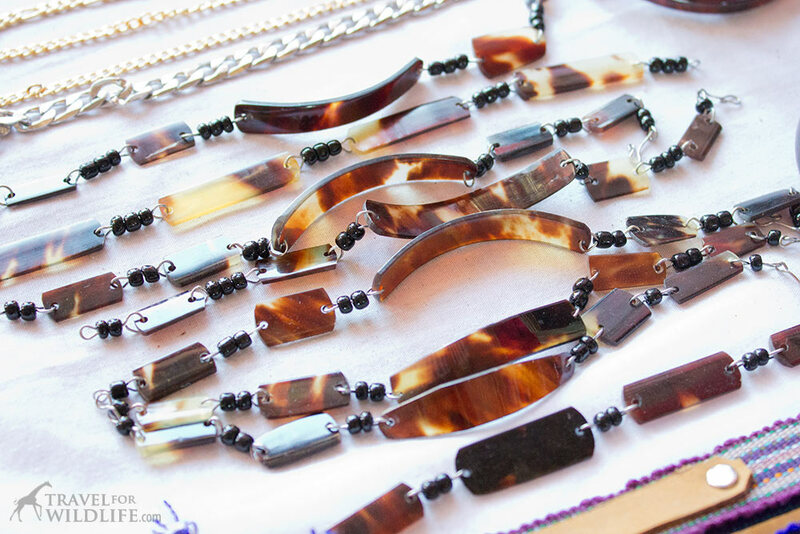 But in Central America and Southeast Asia, many countries still illegally sell tortoiseshell products that are made from the shell of the endangered Hawksbill sea turtle. 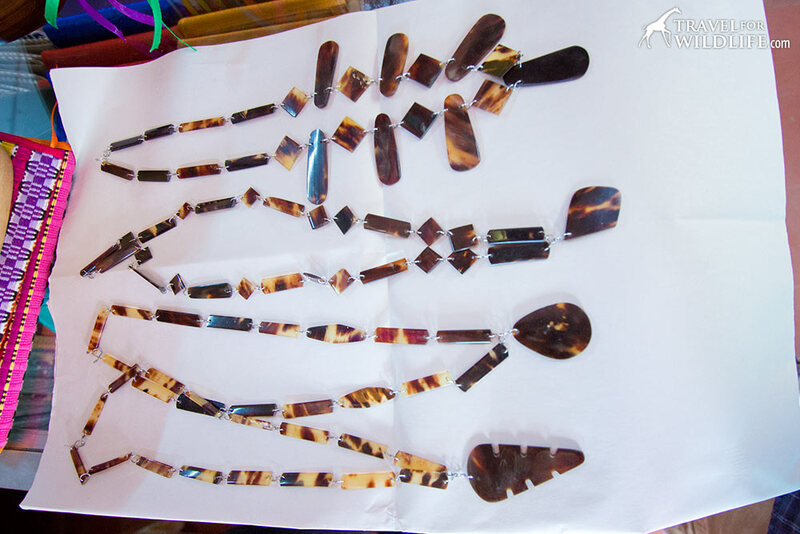 Nicaragua is the main offender in Central America but there have been reports of hawksbill turtle shell products for sale in tropical countries around the world, including parts of Africa. 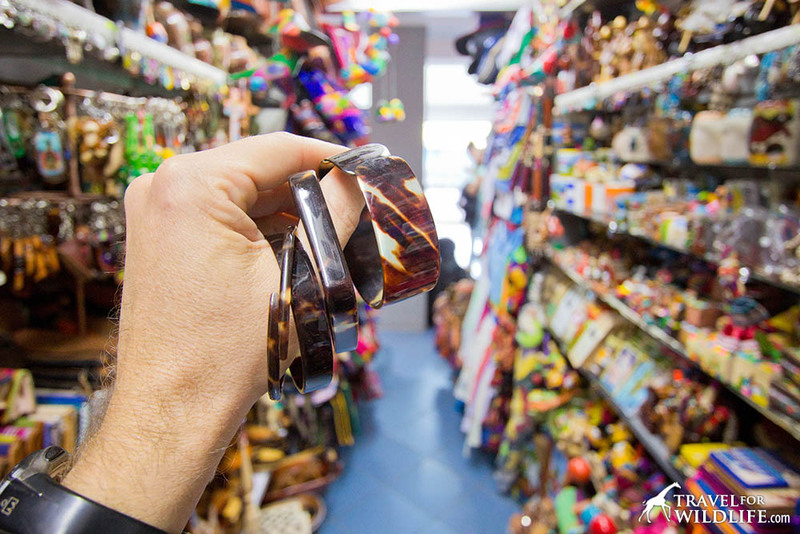 To see a complete list of countries in Latin America and the Caribbean where you should watch out for endangered turtle shell souvenirs, read the Turtle Shell Report from Too Rare to Wear. 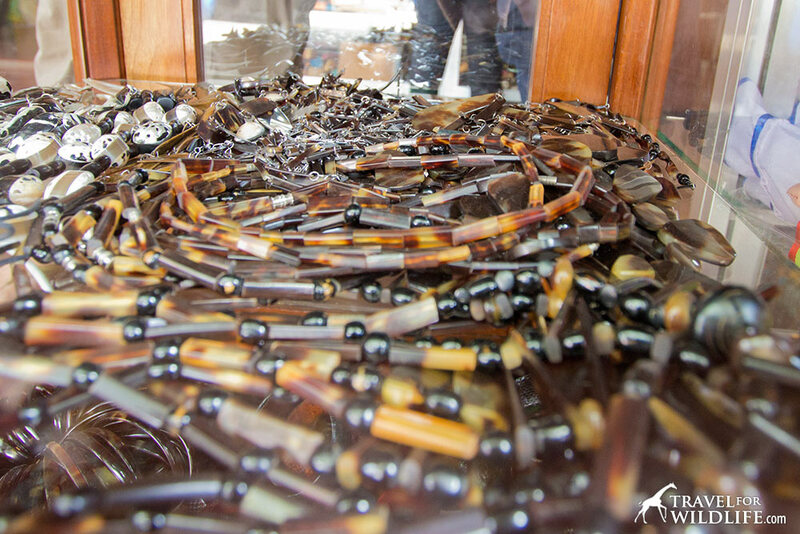 Illegal sea turtle shell bracelets for sale right in the Managua International Airport, Nicaragua. 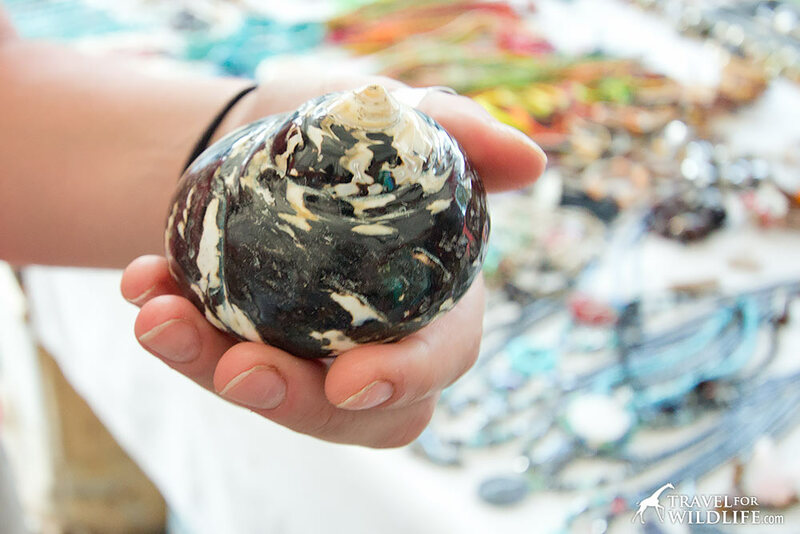 As a traveler, it’s important that you be able to identify and avoid souvenirs made from endangered turtle shell, not only because it is illegal to buy and bring home, but because you can help save the Hawskbill from extinction. 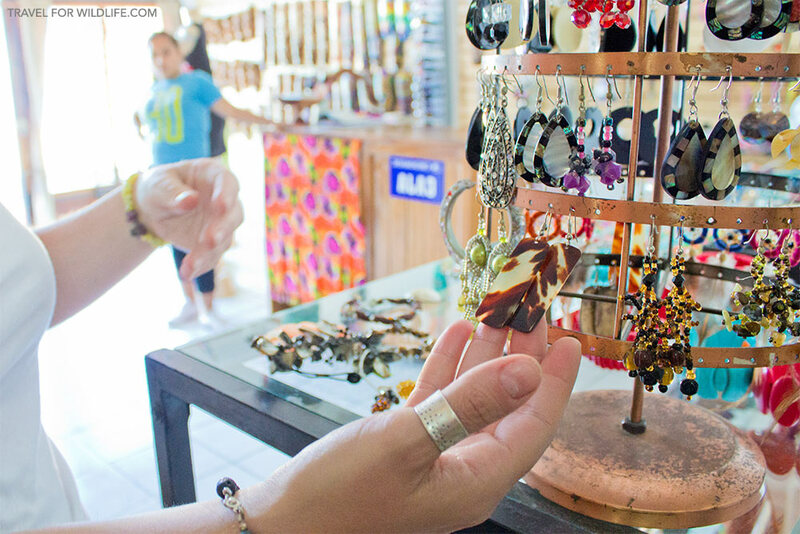 We were just in Nicaragua shooting for the Too Rare to Wear campaign and we found turtle shell souvenirs for sale in dozens of different shops in four different popular tourist towns so we’ve seen a lot of it up close and we’ve become very good at identifying it. Here’s how to do it. The first and most important thing you can do is ask what it’s made of. The simplest way to say this in Spanish speaking countries is “Que es?” meaning “what is it”? 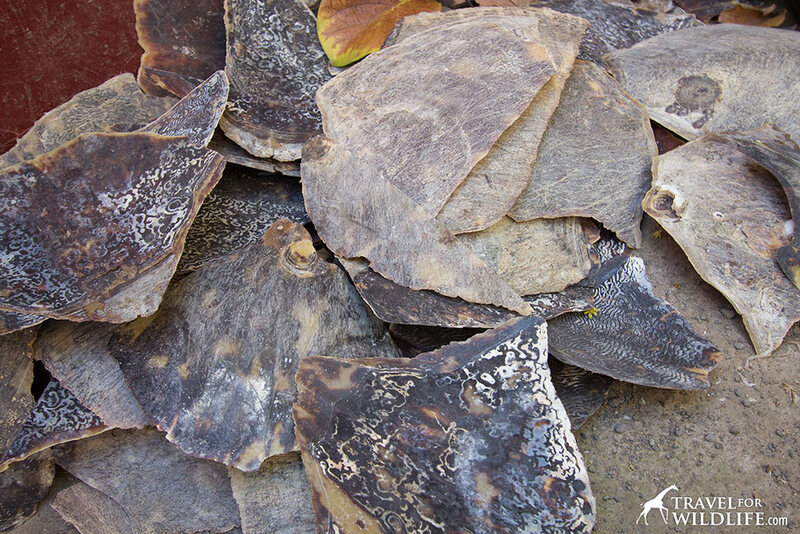 We found that in 99% of cases, vendors in Nicaragua were honest when asked what a turtle shell product was made of. They all said “Carey”. Carey is the Spanish name for the hawksbill sea turtle. 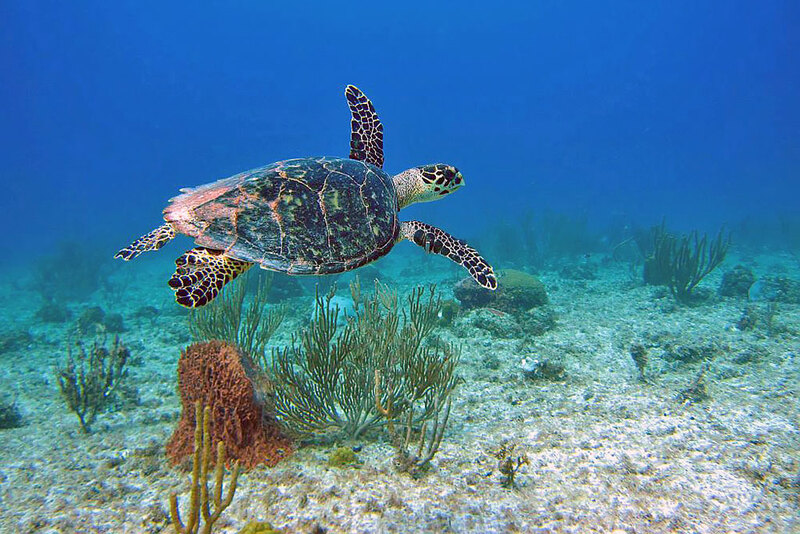 Carey is the Spanish name for the hawksbill sea turtle. (It’s pronounced kah-RAY.) 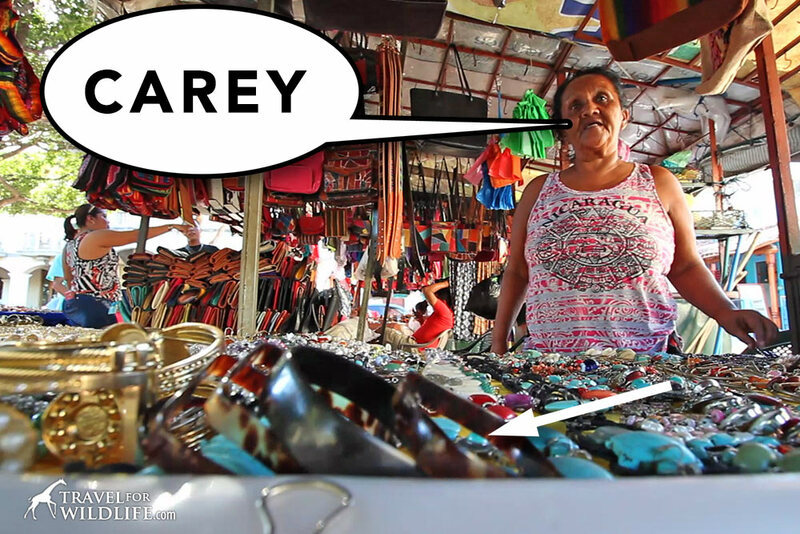 If you want clarification you can say, “Es tortuga?” meaning “Is it turtle?” If the vendor tells you it is made of “carey”, feel free to express your disgust and walk out of the shop. 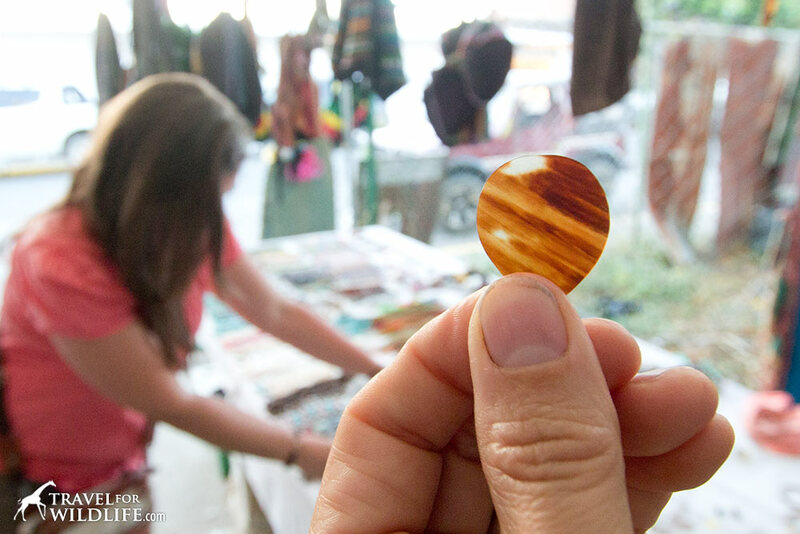 While it is illegal to sell sea turtle shell products in Nicaragua (and nearly every other country in the world) the law is rarely enforced and vendors are very open about selling it here. 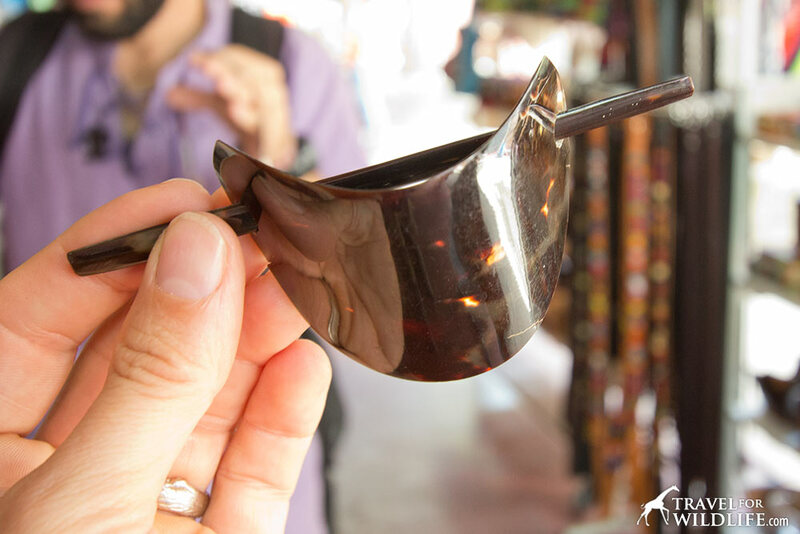 In other countries, like Cuba, vendors may be more cautious about showing their turtle shell products to buyers. 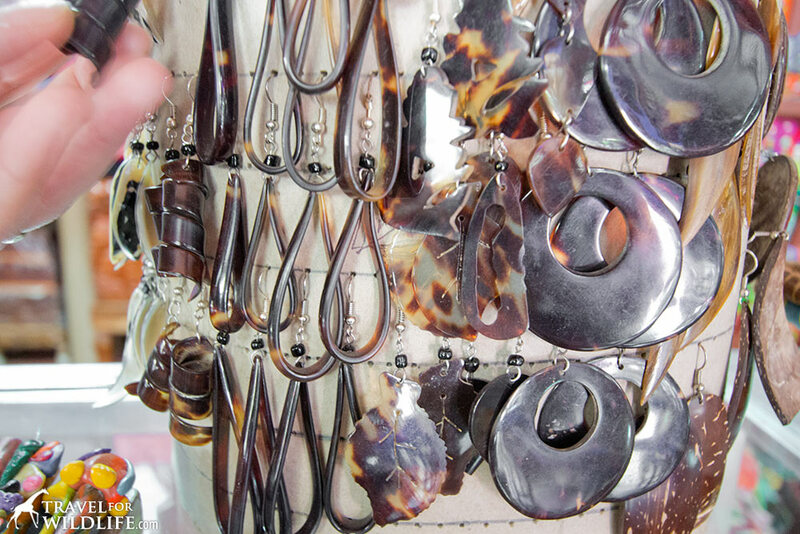 Products made from sea turtle shell usually appear a solid dark brown color when you first see them hanging on a display, but if you hold them up to the light you’ll see that the light-colored areas are transparent and you can see the light through them. These light areas are an orange or amber color. Sea turtle shell is transparent when you hold it up to the light. The next main indicator is that sea turtle shell products are thin and flexible. One vendor even told us we could bend a turtle shell bracelet as far as we wanted without breaking it. You can read more about that incident in the plastic section below. This natural flexibility is one of the main reasons that turtle shell has been such a popular material to use in making decorative items for thousands of years (other than its beauty.) Turtle shell is a natural ‘thermoplastic’. This means that by applying heat it can be bent into new shapes and it will retain that shape, just like modern plastics. 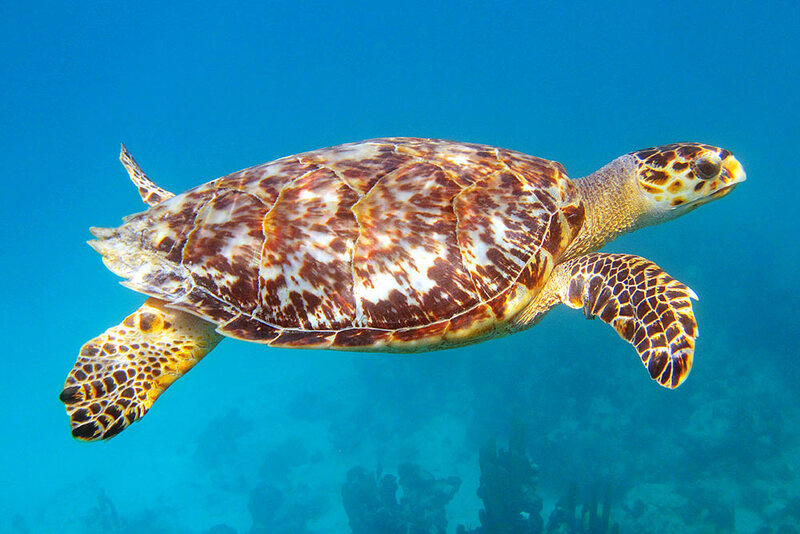 Hawksbill turtle shell has an irregular streaky or spotty pattern that runs all the way through the material. 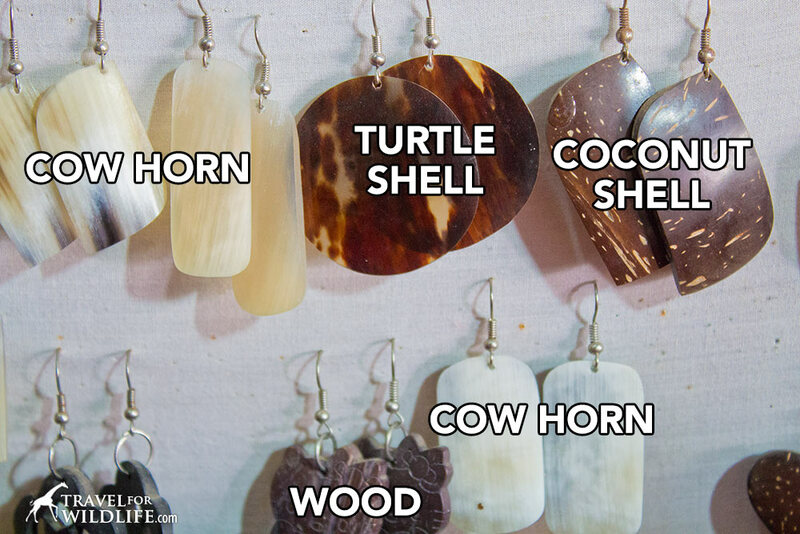 Here is a gallery of common turtle shell products found in Nicaragua and other parts of Central America so you can become familiar with the pattern as well as recognize common products to watch out for. Turtle shell bracelets with black coral beads. 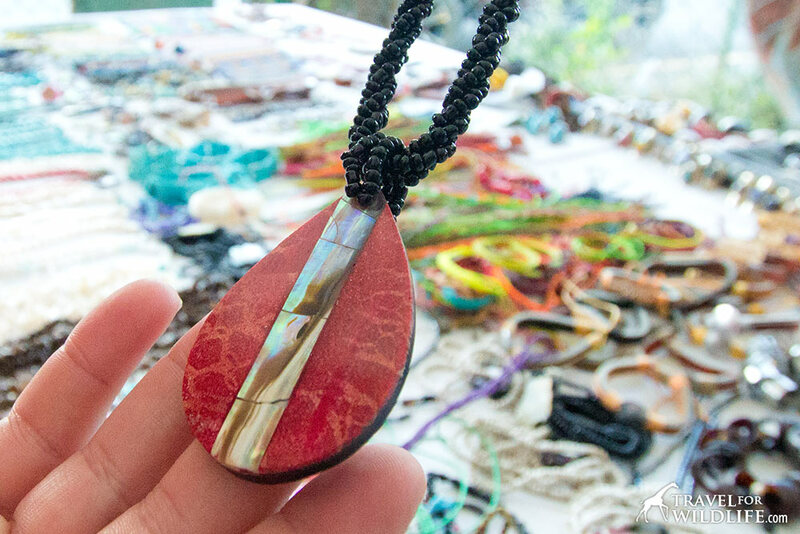 Hawksbill turtle shell necklaces with black coral beads. 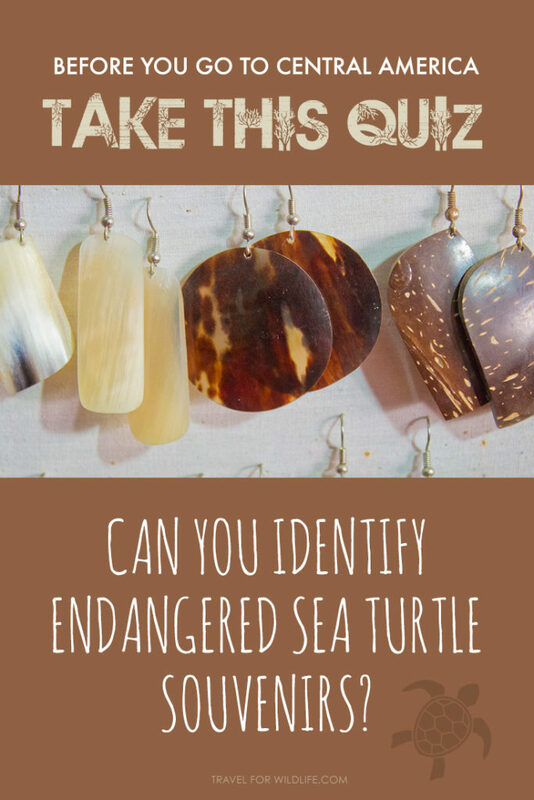 In some places they may not tell you what it’s made from, so then it’s up to you to learn how to tell the difference between sea turtle products and similar looking items. 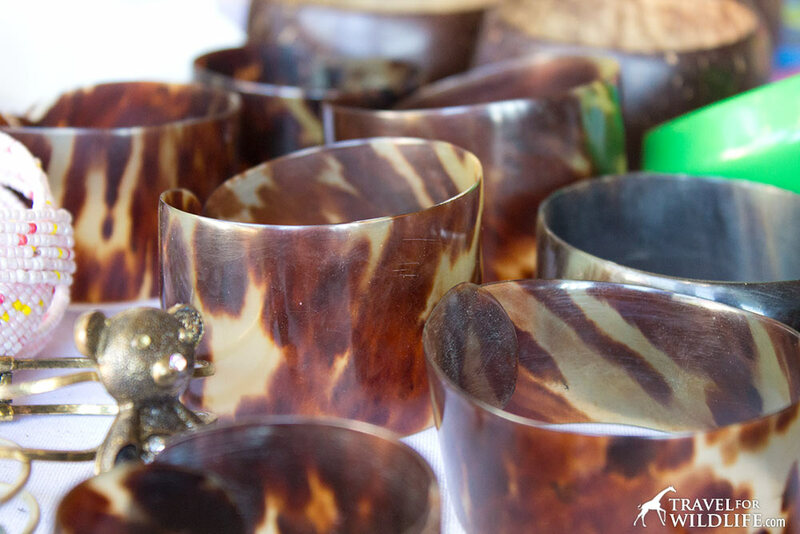 In Nicaragua, probably the most similar-looking material to sea turtle shell is cow horn, which is known locally as “cacho“. Sometimes cow horn is transparent. it comes in a different range of colors, usually from black to grey to white and sometimes a creamy yellow. 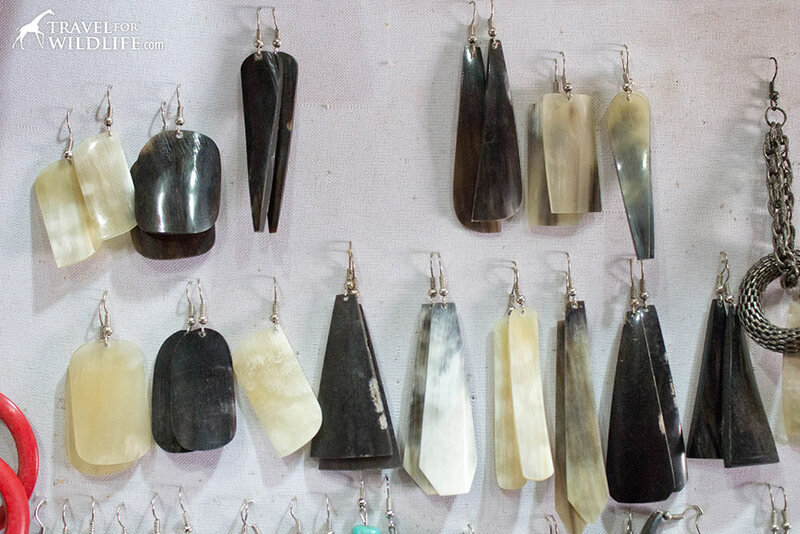 Cow horn jewelry comes in range of colors from black to grey to white and creamy yellow. But for me the dead giveaway for cow horn is that it has a fine linear grain that runs all the way through it, like your fingernail, whereas sea turtle shell has no visible grain to it. 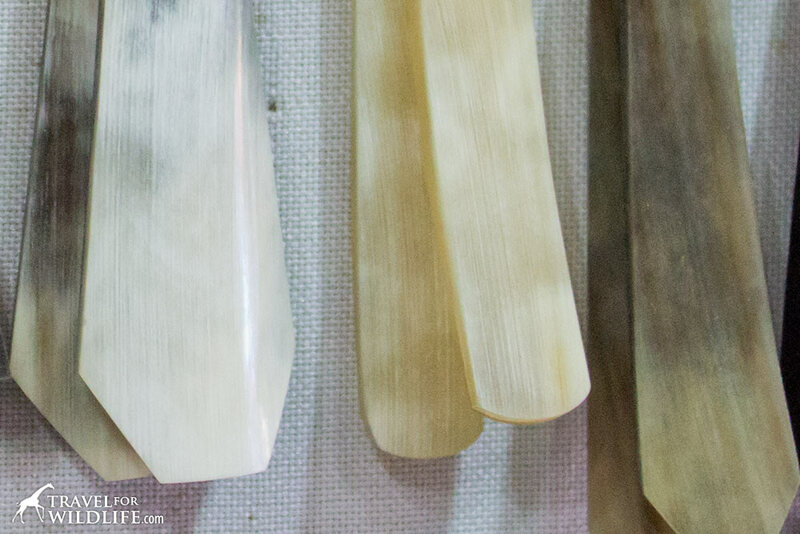 Cow horn has a fine linear grain running all the way through it, like your fingernail. 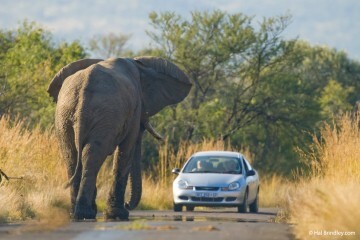 Also, unlike turtle shell, cow horn is not flexible. 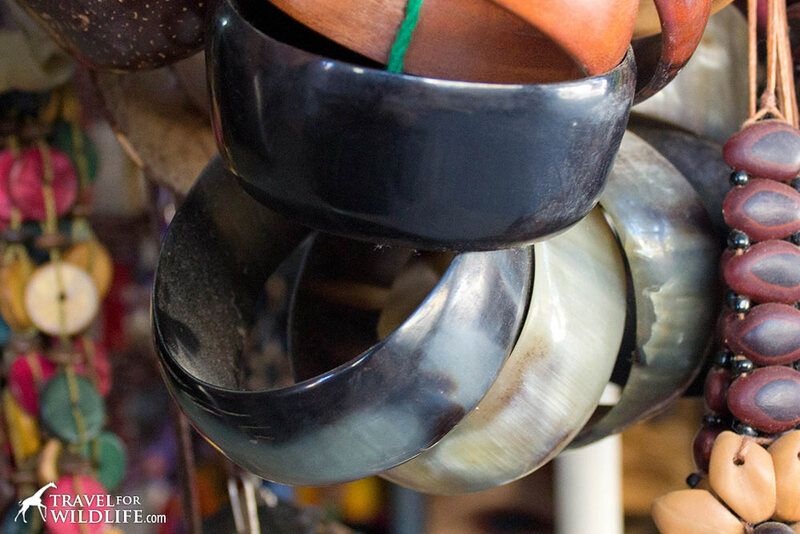 The most common cow horn souvenirs we saw in Nicaragua were bracelets and earrings. If a vender answers “coco” that means the item is made of coconut shell. These look similar to turtle shell at first glance because the dark brown tones in coconut shell look a lot like the browns in turtle shell. Coconut looks similar at first glance. 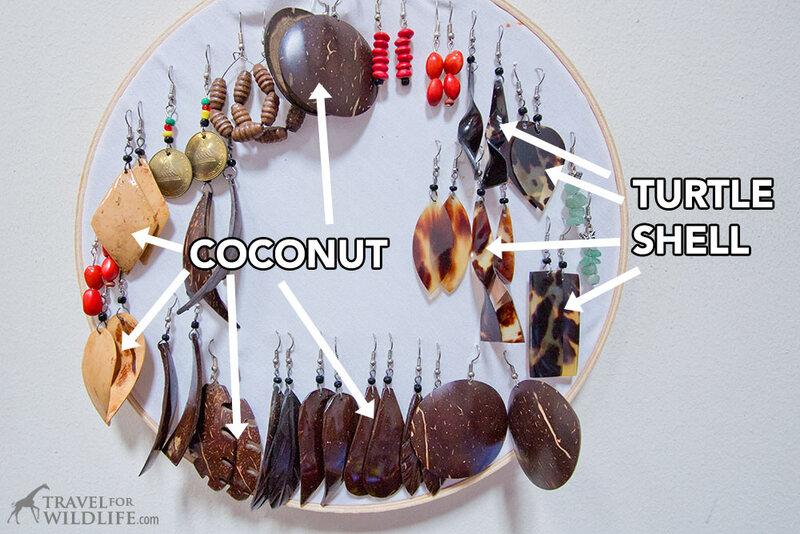 Turtle shell earrings above, coconut shell earrings below. But brown coconut shell jewelry nearly always has small light tan nicks in it, although occasionally it is carved down entirely to the light tan layer with only accents of dark brown. 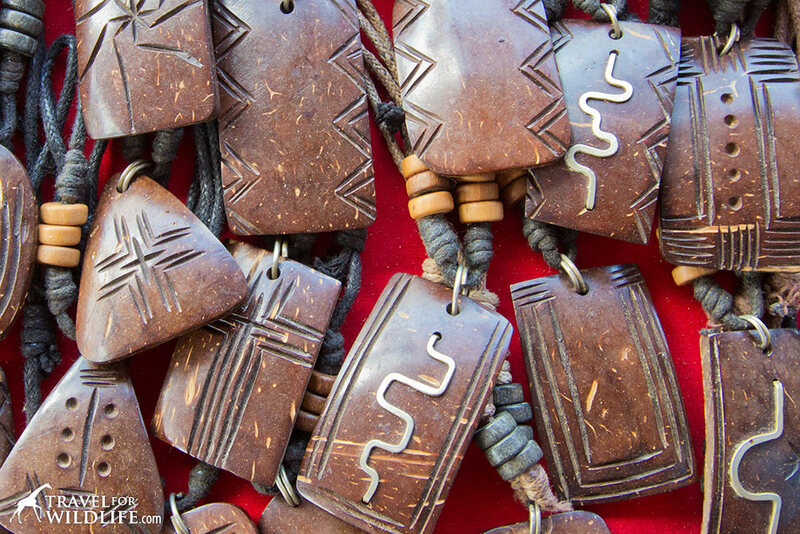 Brown coconut shell jewelry (like these necklaces) always has light tan nicks in it. 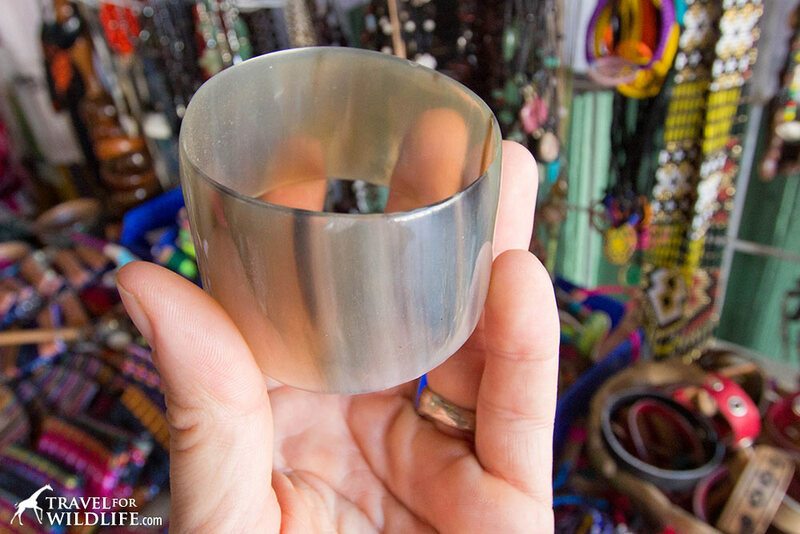 The main giveaway is that coconut shell is never transparent, never flexible, and usually you can see the bumpy grain of the inside of the shell on the back of the piece. 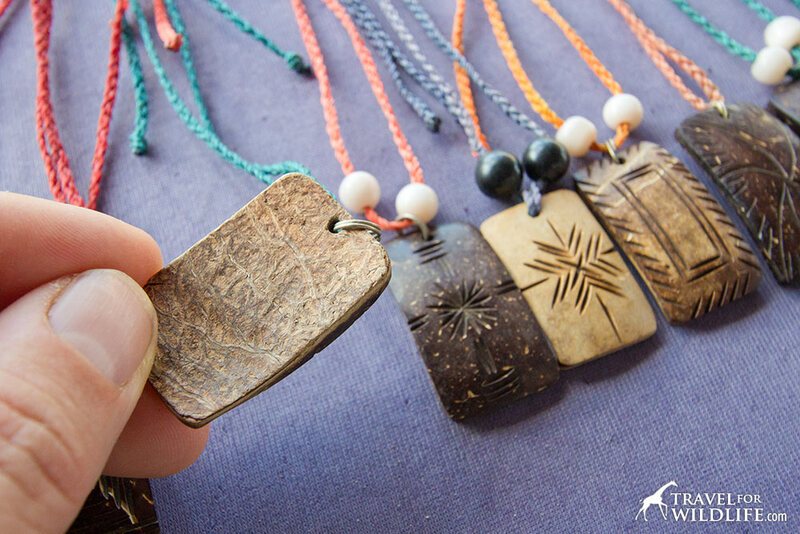 The bumpy texture of the inside of the coconut shell is visible on the back of coconut jewelry. 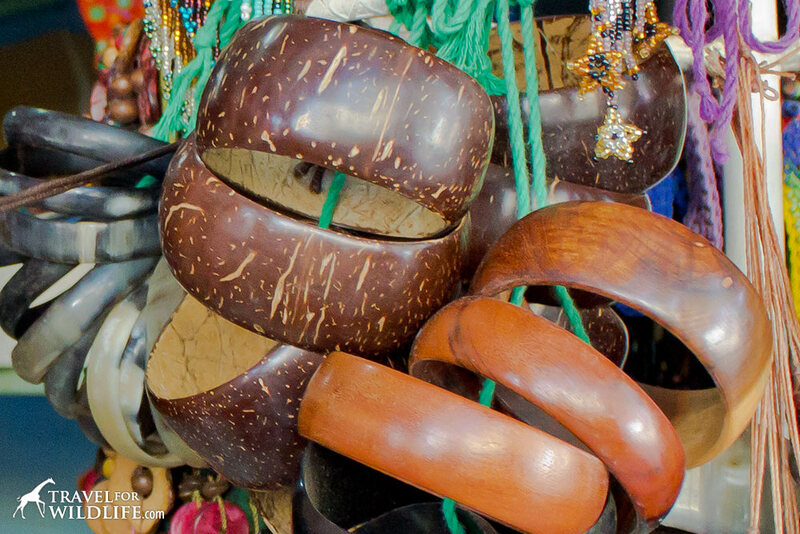 The most common coconut shell souvenirs we saw in Nicaragua were earrings, necklaces, and bracelets. Coconut bracelets next to wood bracelets. You may also hear a vendor respond that an item is made of “concha” which means “shell” but what they’re referring to is seashell. The seashell items commonly seen in Nicaragua have a specific color pattern of white with black spots and are not easily confused with turtle shell. The white and black color pattern of seashell is not easily confused with turtleshell. Locally this shell is called “concha nacar”. 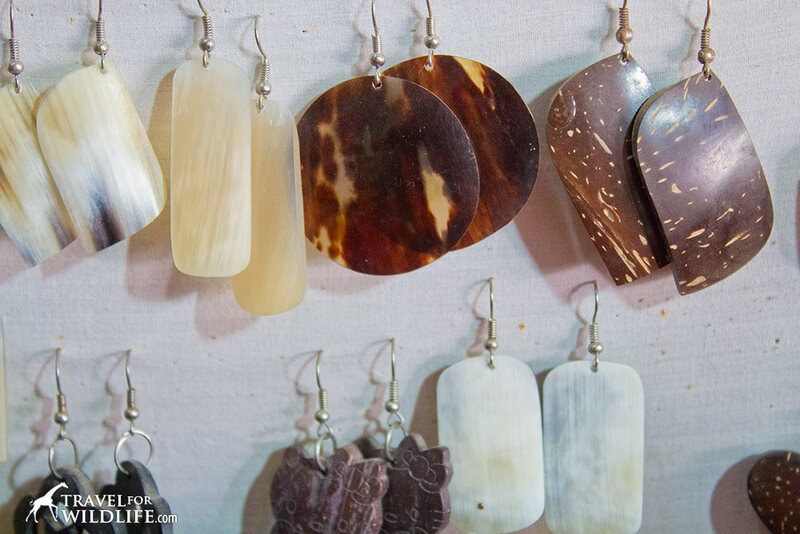 Seashell earrings in Nicaragua are white with black spots. They are very hard and never transparent. The only seashell souvenirs we saw for sale were earrings and whole shells. 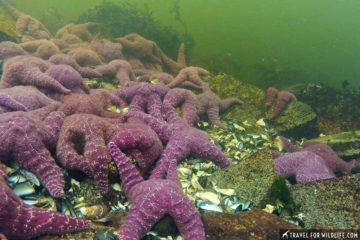 We don’t recommend buying items made from seashell because the animals are killed to collect their shells, whether through intentional harvesting or as by-catch in commercial fishing. Now you may be asking yourself, how do I know it’s not plastic? Unfortunately, it can be very had to tell good imitation plastic tortoiseshell from real sea turtle shell. 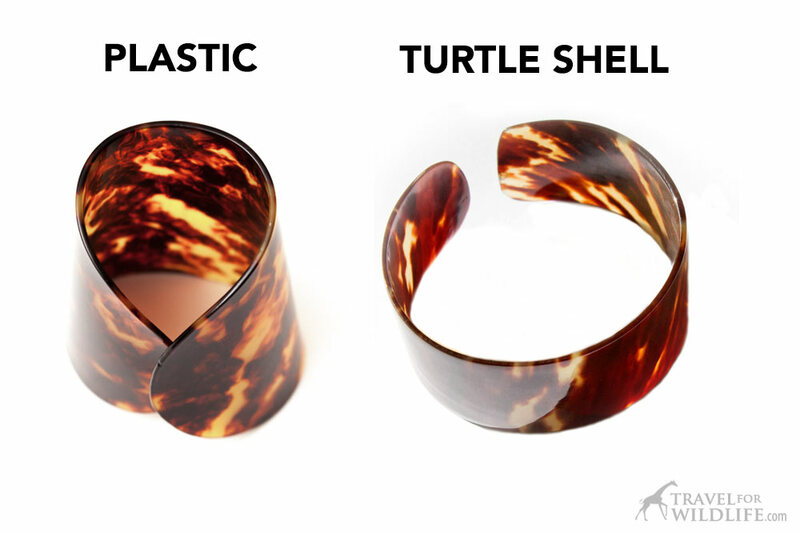 It can be very hard to tell good imitation plastic tortoiseshell from real sea turtle shell. 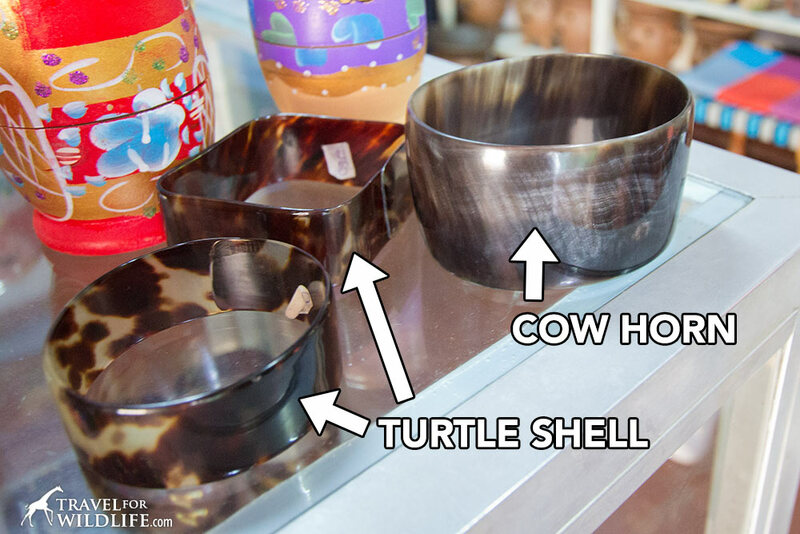 Only one vendor in Nicaragua attempted to tell us that a tortoise shell item was made of plastic. But we can say with confidence that 100% of the tortoise shell souvenirs we saw for sale here were made from actual sea turtle shell. 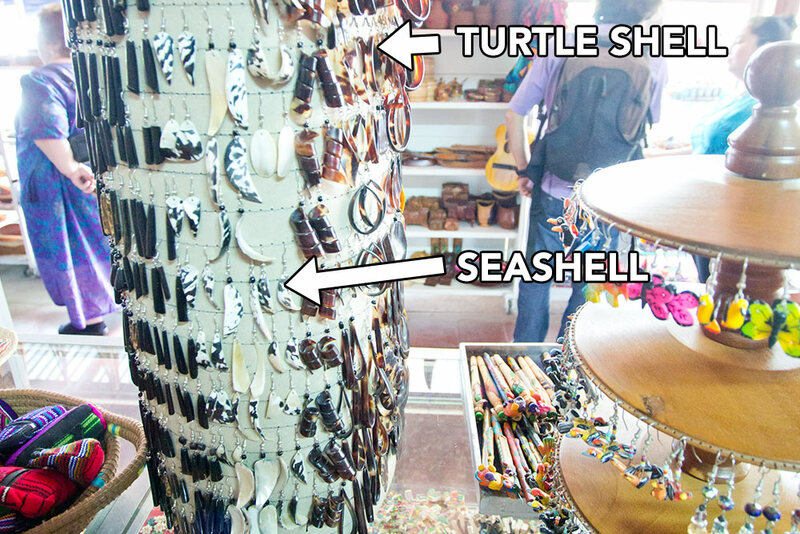 So your best bet is to never buy anything in tropical countries that looks like turtle shell, period. Once you learn to recognize the colors and patterns of real sea turtle shell, you may be able to recognize poor imitations made in plastic, especially if the patterns are only printed on the surface. (In real turtle shell, the irregular patterns run all the way through the material) For some examples of this, just run down to your local drugstore and walk down the hair accessories aisle. 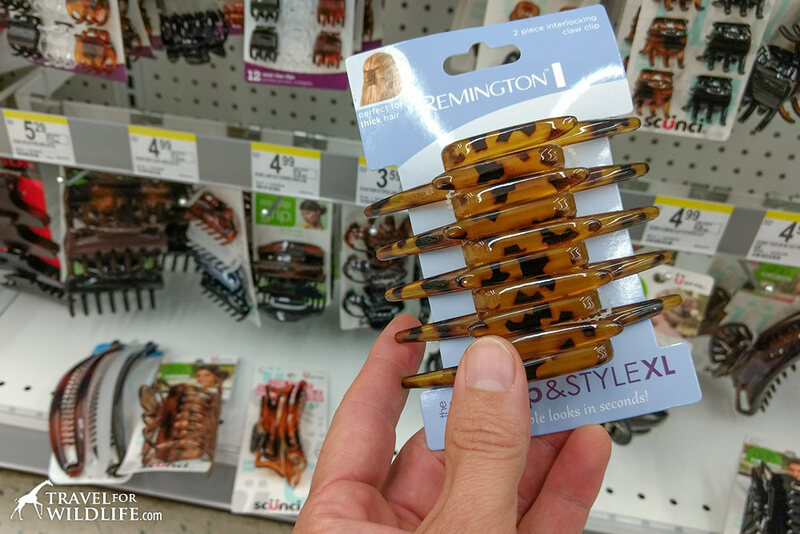 You’ll find dozens of plastic “tortoiseshell” hair clips and hairbands printed with poor imitations of turtle shell. 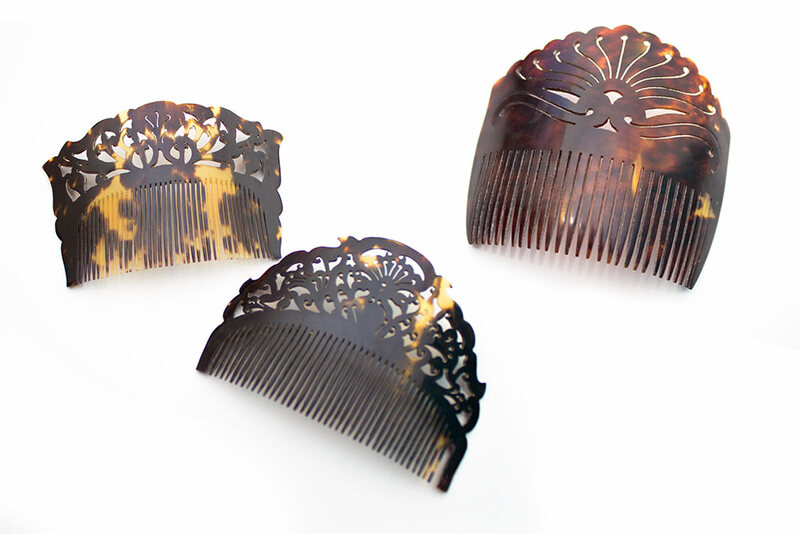 The imitation plastic tortoiseshell you see in your local pharmacy doesn’t look much like real hawksbill turtle shell. 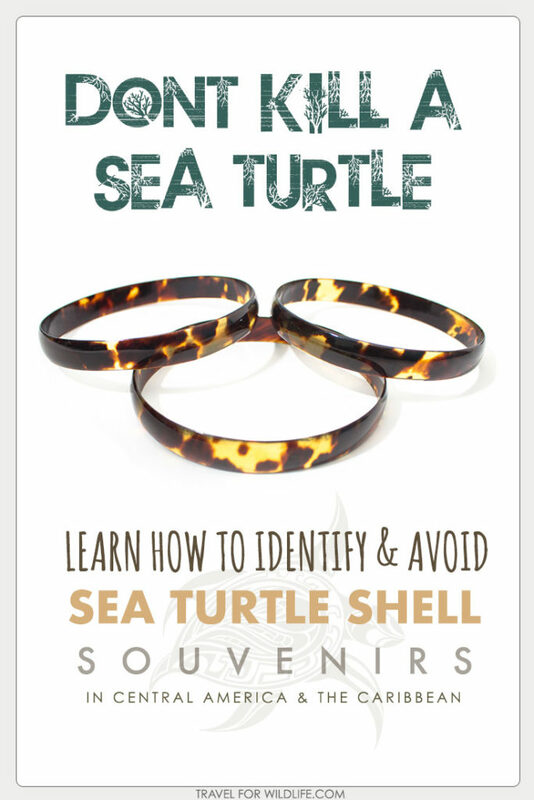 Another way to study fake turtle shell is to do a search for tortoiseshell jewelry on Etsy. Some of it doesn’t look at all like real turtle shell, but some of it is pretty convincing. 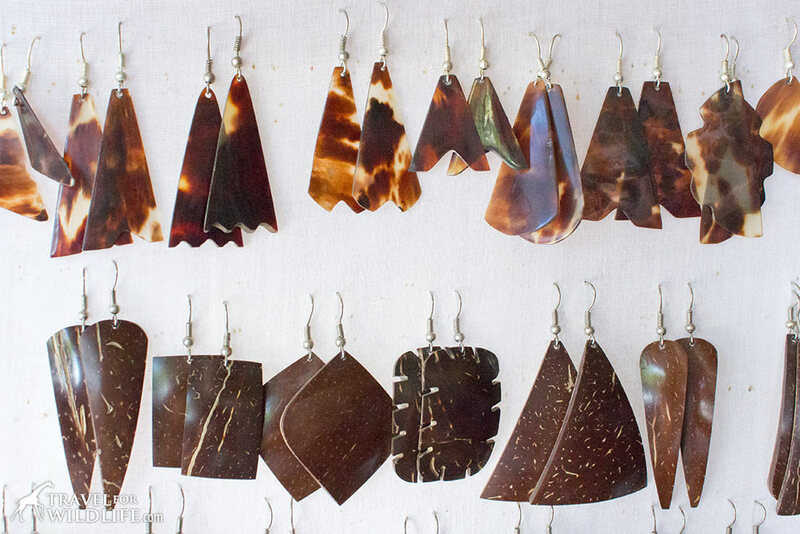 (Thankfully it is illegal to sell real sea turtle shell pieces on Etsy so this is all “faux” tortoiseshell.) However, if you don’t have much experience with real turtle shell, it can be very difficult to tell a good plastic imitation from the real thing. The only reliable test we know to determine whether an item is made of sea turtle shell or plastic is to burn it. Burning plastic has an unmistakable disgusting chemically smell (because it is petroleum-based), but sea turtle shell smells only mildly of burning hair because it is made of the same substance called keratin. A pile of sea turtle scales, or “scutes” waiting to be carved. Of course you can’t actually do this test in a market. But one vendor told us that we could bend a sea turtle bracelet as much as we wanted without breaking it, so Cristina tried it and she broke one, which meant we had to buy it. So I had a piece of sea turtle shell that I could try the burn test on. 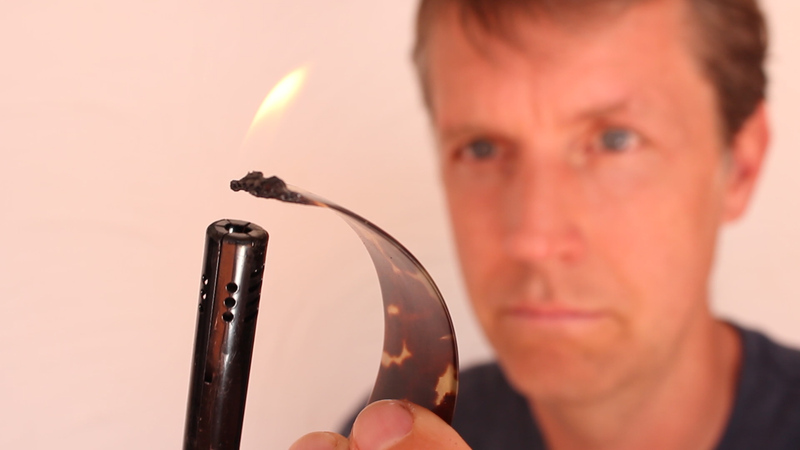 Burning is one of the only reliable tests to determine if an item is plastic or sea turtle shell. It was definitely not plastic. It burned to a bubbly dark black color and smelled only mildly of burning hair. Other items to avoid in Central America are black coral and red coral. 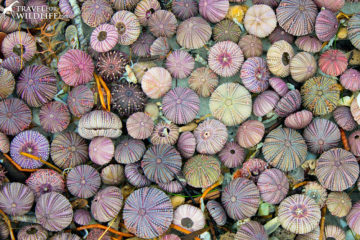 The depletion of living coral for souvenirs is a serious threat to coral reefs throughout Central America and the Caribbean. Red and black coral are endangered too! Don’t buy it! 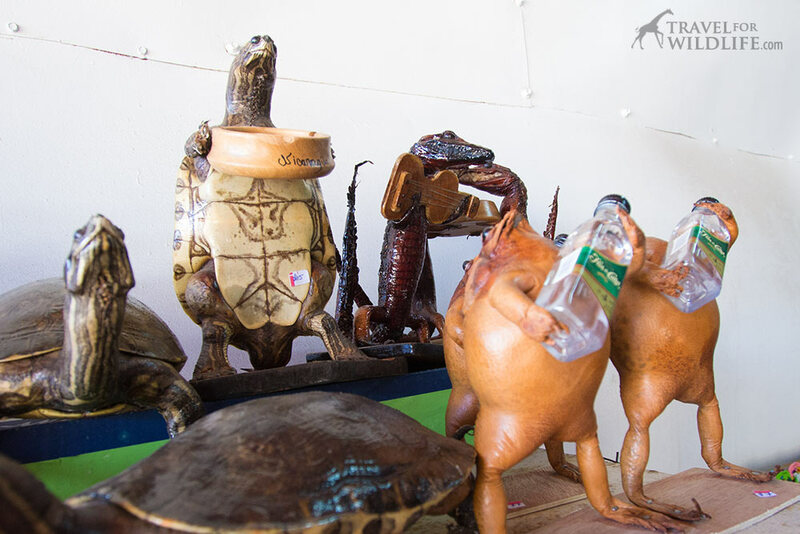 You may also see a nauseating array of other souvenirs made from animals including frogs, crocodiles, and other turtle species. Please don’t support this disgusting trade of killing animals for the sole purpose of making tacky souvenirs. Freshwater turtles, crocodiles, and toads. 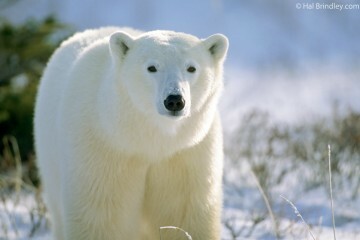 Please help stop the disgusting practice of killing animals to make tacky souvenirs. Don’t buy it! 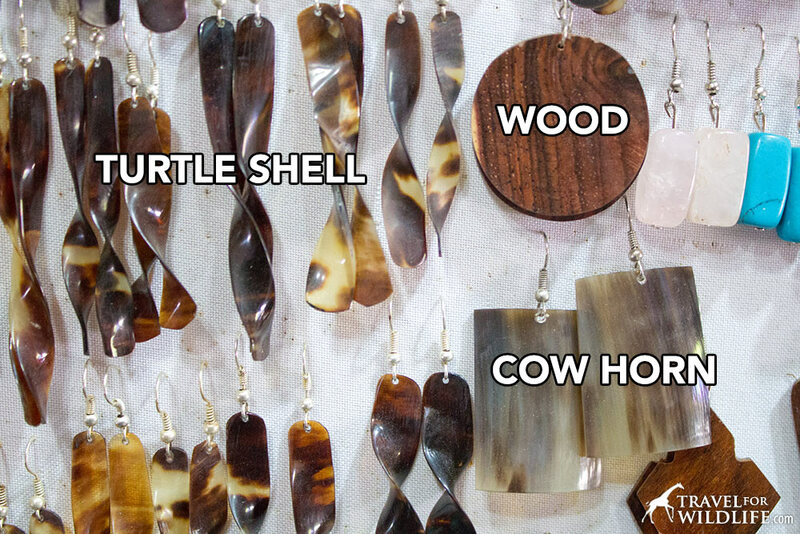 And of course, if you want to help save the beautiful and critically endangered hawksbill sea turtle from extinction, never buy souvenirs made from turtle shell. Ready to Test Your Skills? Take the Quiz! 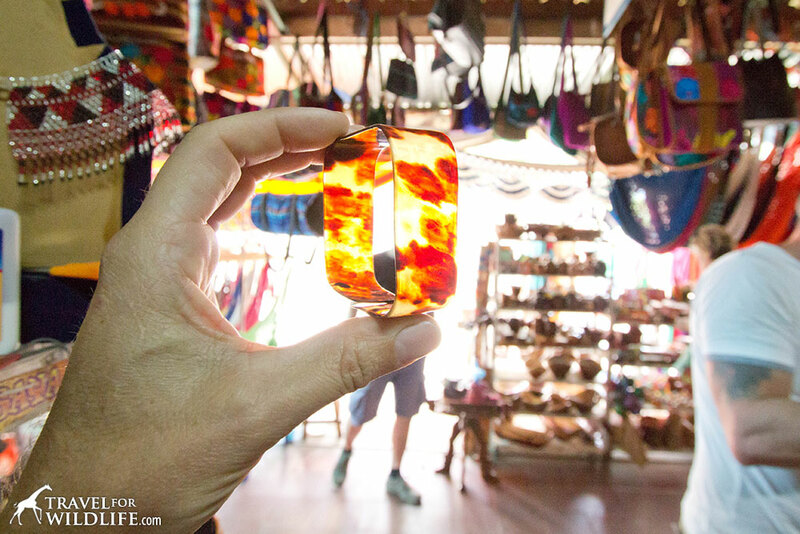 OK Eagle Eye, now you know how to tell endangered sea turtle shell from other souvenirs. It’s time to test your skills. 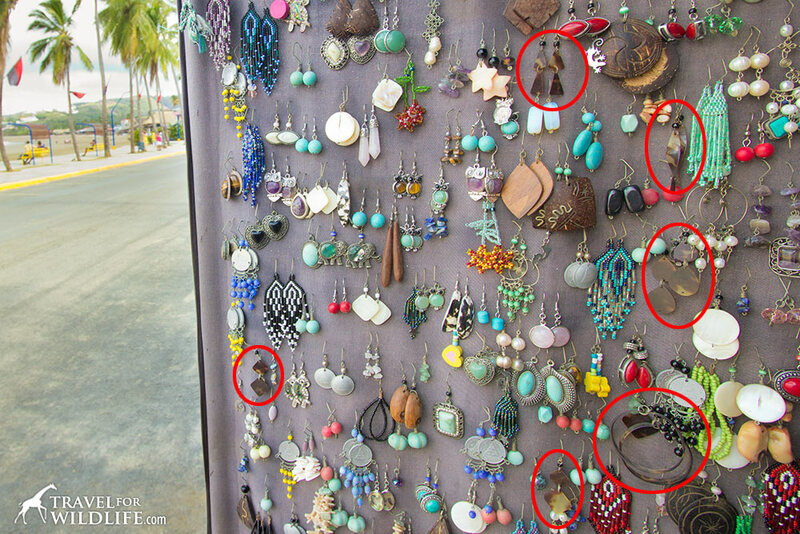 1) Check out this photo and see if you can tell which earrings are turtle shell and which ones are coconut shell. When you’re done, scroll down to see the answer. ok time for round two. 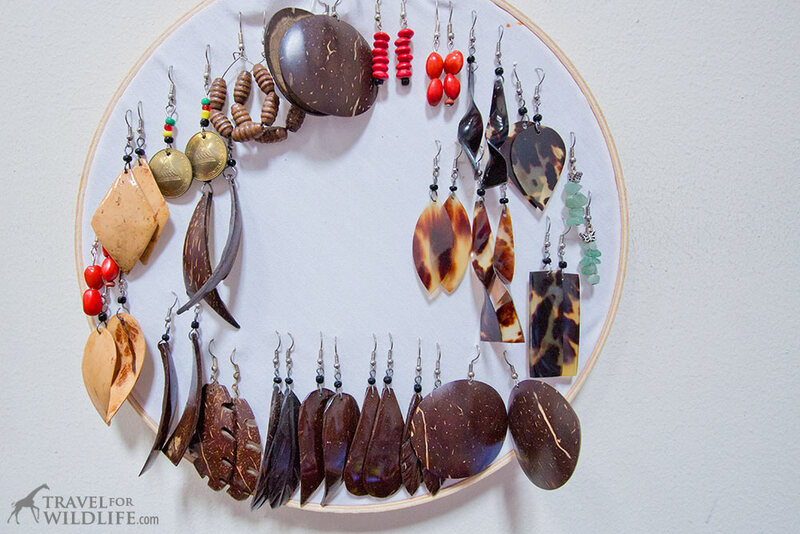 2) Which of these earrings are turtle shell and which ones are cow horn? Did you catch it? 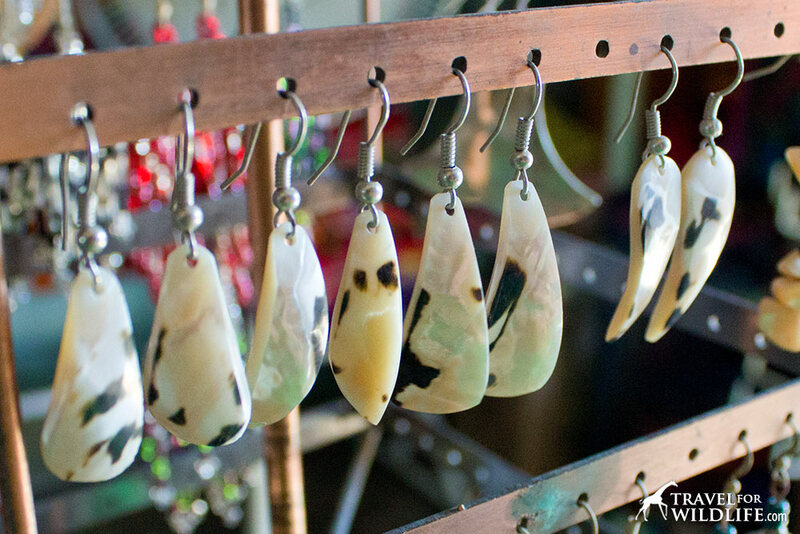 There is only one pair of cow horn earrings, given away by the fine linear grain that runs through it and the different color tones. This photo has cow horn, turtle shell, coconut shell, and wood. You’re getting good at this now right? 4) OK, last test. 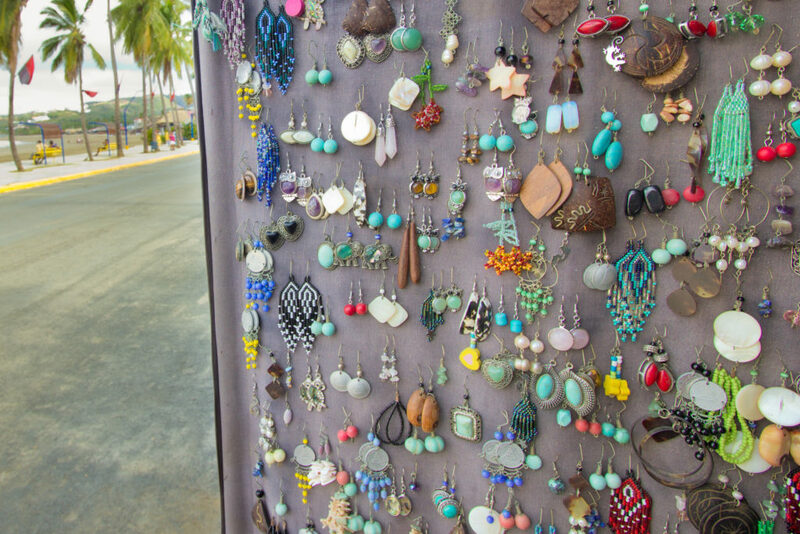 The following photo shows a display in a souvenir stand in San Juan del Sur, Nicaragua. There are six pairs of turtle shell earrings hiding in here. Can you find them all? (Click the image to open it at a larger size in a new window.) If you found all six items then you are officially a turtle shell expert. Share your new skills with your traveling companions and help spread the word! 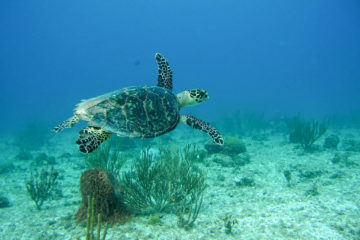 If you want to learn more about saving the hawksbill, visit Too Rare To Wear.org and sign the pledge. Please use one of the three pins below to pin this article in your favorite Pinterest board and spread the word!